Following on with the new feature of blog posts from beginners, sharing their journey and experiences, we have Craig Sanders back with his 3rd post. I managed to meet Craig when I was over in Australia a few weeks ago and one thing that stood out was that his determination was plain to see, and more importantly, the structures - both mental and physical - he was creating around himself to make sure he achieved his goals. I have no doubt his trading journey will be an exciting one to follow! First, a quick shout out to the course itself and to state how amazingly well structured and informative it is and a heads up to Decisive Trading for having designed such an easy to follow awesome ‘Zone Trader’ course. So jumping right back in where I finished from my previous post regarding identifying common mistakes I had made in November 2015 upon completing the Zone Trader course and charging full steam ahead! This is a basic highlight to remind you and just explain to any aspiring beginner traders that mistakes do and will happen…. and that its ok! Its normal! Frustrating but its normal. The only real secret behind it all is to “learn” and push on forwards. “Screwed up bigtime. Traded against 12pm UK news and shouldn’t have! Then re-traded without following trading plan and doubled my trade. Went to bed & left trade to run, causing another losing trade!! -74 points, Don’t trade the news!! No doubles!! Topped up account to 10k”. As in the Zone Trader course, there is a document module alone with an explanation into why trading the news isn’t advised and how to avoid it. Also throughout alternative modules, the ‘news’ is spoken about and also builds part of the puzzle for when approaching each trading day and what times to avoid or be mindful of depending on the trader’s preference. So, I’ve done the course, iv then decided I’ll do the course again and now break it down with my own key notes in a bigger educational diary for quick and easy access when needed (highly beneficial btw). My first 2 weeks in November after finishing Zone Trader were outstanding to say the least. Outstanding to the point where I’m slaving away in the 40+ sunny desert out in the beautiful outback Australia :-/ in my day job, half way into my shift and mentally talking to myself and almost convincing myself that I shouldn’t be doing this anymore, I can trade and make a reasonable living fairly easy whilst sat in the air-conditioning at home and answer to no-one but myself. Another week slipped by in the markets, religiously there I was trading each evening after my 12 hour shifts, racing back to my mobile camp after dinner to get showered and set up for the market opening and continuing to make good progress following my trading plan. Out of nowhere, the markets didn’t play ball on this 1 particular evening and I made the error of ignoring my rules and what I had learned in the course regarding trading around the news. The course specifically advises with logic reasoning why it’s best to not trade the news, yet I thought differently or should I say I didn’t think at all?! Or I knew better?? (this sounds about right). I remember it being around 4 hours into the FTSE opening and I still hadn’t got a trade-off yet. Feeling frustrated and the clock ticking and bedtime approaching fast, I was eager to make a trade, just the 1 trade when the sign shows itself I thought. Then at 11.55pm (GMT) a beauty of a bullish Pin bar forms before me in a high probability key zone and within seconds I had convinced myself that ‘everything’s in line Craig, yep’ Are your rules met Craig? Yep, all met. Without hesitation I entered the trade with a ‘long’ position at what I thought at the time a perfect time and then before my eyes watched as the 12pm UK news un folded… Now aware of but not until the large bearish spike dashed before my screen like a lightning bolt jumping out my laptop and striking me as a sign to say WAKE UP, I was instantly stopped out of the trade and due to the slippage factor I was -2% negative of my trading account. Sheer disappointment and anger that the news could do this to me and un-willing to accept that it was me breaking my own rules. Within minutes of another candle forming I would show this market who’s boss and what looked to be a bearish continuation of the news spike, I had re-entered into a bearish ‘sell’ position, hoping to win back my previous 2% loss. In order to achieve this and for the fastest time to achieve this was for me to double my trade and what I thought at the time, ride it into the below key zone. This way I will be in profit and can go to bed! The markets didn’t perform as Id ‘expected’ and seemed to be staggering sideways for a further hour or so. Due to being frustrated, tired and disappointed (although un-aware at the time) I had decided to leave the trade running (plain crazy) and go to bed with a stop loss set of a further 2% and a limit order set of 2%. All in the hopes of waking up fresh as a daisy before work and seeing a 2% profit before the day gets started. However, having pulled myself together and staggered over to my laptop in desperation of loading my charts up and expecting to see a profit, there it was, a further 2% loss! Yay NOT! Totalling a 6% draw down on my account, I was fuming, fuming to a point where I refused to go and get breakfast like a spoilt kid and decided to head straight to work frustrated and hungry. The above description in theory is a very straight forward process to avoid and yet when the time comes its surprising how silly the choices us individuals actually make and act on! It’s clear I was impatient, tired, eager etc … basically its very clear I was in the wrong frame of mind and really shouldn’t have traded at all on that particular evening! As a beginner and when hitting a few winning streaks, it’s so easy to become over-confident in one’s ability to read the markets and make not only costly but emotional mistakes as I did above. This of course set the tone for the remaining few days thereafter and caused further rushed decision making and the chasing of irrelevant signals, which of course resulting in further negative results! Towards the very back end of November, early December I had thankfully regained my calmness and level headedness and began to climb back out of the hole I had created for myself. This is where the very first matching of my chart screenshots and diary log combined for the same day came together. Resulting in a self-analyse at the end of the month and each day checking over what emotional state I was in prior to and after. Although some would say that the above is obvious and having done the course then one shouldn’t trade the news! However, this is of course what I also thought at the time when things were going great. What my point is and with any rule, not just the news…. It’s very, very easy to skip particular rules dependent upon one’s emotional state in the heat of the moment! This isn’t always identifiable and clearly wasn’t in my case and needs much attention and focus for mastery. 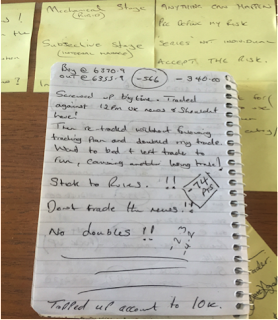 Regardless of the emotional state I was in during this particular trading day and without diving into the ‘mindset’ realm of what should and shouldn’t have been done….. I hope the basics of the above clearly highlights just how easily one can land in a sink hole and continue to self-sink themselves even deeper. Overall, not only did I ignore the news but I also dropped into an emotional trance that made me act and re-enter another trade with a very poor signal, if no signal at all and also I encouraged myself to double my risk management principles all because of ignorance and my un-willingness to accept a loss. I hope to clarify further problems I’ve faced in the months after the above to the point I’m at today in hoping to give you some further valuable insights into how easily one can sabotage themselves. Thus hopefully creating part of an avoidance tool for your progress moving forward with trading. Thanks Craig. there is a definite human urge to ignore the rules and go ahead with something you 'feel is just gonna work'. I've done it and still feel a real compulsion to just 'go for it'. in retrospect I don't know what or where this compulsion comes from, I know it's not greed. If you find out do tell us. Although I find it slightly easier to deal with when you recognise it. Oh...I can sooooooo relate to this !! !